Think Africa is the answer to everything wrong with the culture surrounding hip-hop in the United States? Think again, says Afua Hirsch. The capacity of Africans to beat Americans at their own game has not escaped the attention of US hip-hop's megastars. 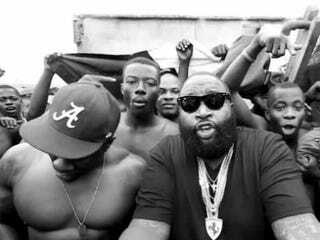 Rick Ross, the prison officer turned rap phenomenon, recently filmed a video for his "Hold me back" single in Lagos. Realising that the ghettos of New Orleans — shocking as they are — seem pretty sterile compared with the likes of Makoko in Lagos, he put out six minutes of heaving crowds, filthy streets, and powerful poverty to accompany his record about, on one interpretation, triumph over adversity. Twitter was a-flutter with similar messages, reflecting the battle over who dictates the image of the new Africa.